Three great pieces to give important visitor or relocation information. Crosswinds is a bi annual magazine that covers the 10 towns that make up the Exeter Area. This magazine includes demographics, government information and utilitiy inforation along with interesting and unique facts about each town. 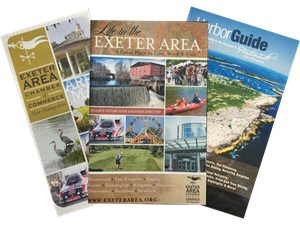 We also include the Harbor Guide that oulines all the fun along the Atlantic Shore in the Portsmouth area. Finally, a paper map is included so you can spread it on the table and get a lay of the land! This product is free if you pick it up in our office located at 120 Water Street in Exeter, NH.